The discussion between the two national security advisers was during a phone call on 16 February, two days after the Pulwama terror attack. 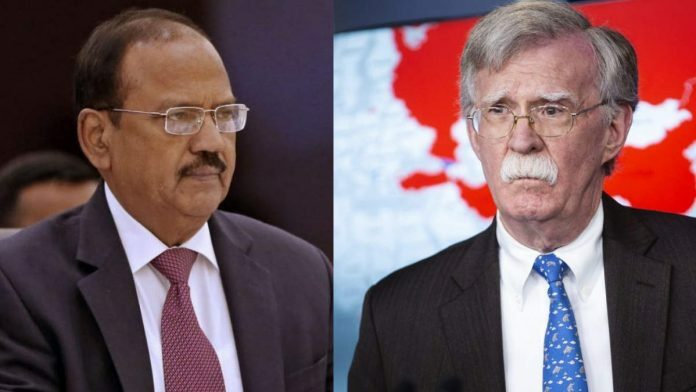 New Delhi: The pre-emptive strike by the Indian Air Force early Tuesday in Pakistan’s Balakot was discussed by Ajit Doval and John Bolton, the national security advisers of India and the US, during a phone call on 16 February, a top diplomatic source told ThePrint. This was two days after the Pulwama attack in Kashmir, in which 40 CRPF personnel were killed a suicide strike claimed by Pakistan-based Jaish-e-Mohammed. The source also said the US was apprised of the intelligence-led operation in which a very large number of Jaish terrorists, trainers, senior commanders and groups of jihadis, who were being trained for suicide action, were eliminated, as stated by Foreign Secretary Vijay Gokhale Tuesday. “India has the full support of the US for this action. This is not going to impact the stance India has taken in moving the UN Security Council,” the source said, adding that the international community is now backing India in its action against the JeM. In a statement issued after the phone call, Bolton said the US supports India’s “right to self-defence”. He also said that he spoke to Doval twice, and expressed America’s condolences over the terror attack. Bolton had also then said the US has clearly stated to Pakistan that it has to end support to terrorist safe havens. “We have been very clear on that score… And, we are continuing to be in discussions we are going to have with the Pakistanis,” he had told the media. US President Donald Trump had also stated that “India is looking at something very strong”. “Given that the Indian Foreign Secretary has termed today’s strike as a ‘pre-emptive strike’, this is one notch higher than the 2016 surgical strikes which was retaliatory in nature,” said Happymon Jacob, professor at JNU and an expert on disarmament. Jacob added that the Pakistani non-retaliation in 2016 has emboldened the Indian military planners.